They say a picture is worth a thousand words. If that is the case, Dan Roam’s book The Back of the Napkin is easily worth a million. The book is dedicated to teaching professionals to use simple drawings to visualize problems and their subsequent solutions. I once had a boss, Brian Montgomery, who was the master of this skill. He could use stick figures, a triangle, some circles, and a few labels and in seconds illustrate a point that I had been pondering for hours. I always wondered how he did it and now The Back of the Napkin is teaching me. These days I frequently find myself exploring new ideas, concepts, and business models. Things like social media integration, data visualization, and organizational marketing strategies. Pretty quickly these concepts can get my head spinning. One easy way to combat this is just to draw the ideas out on paper or a whiteboard. Dan Roam lays out a some very easy, very powerful methods for visualizing and solving problems with drawing pictures. “I can’t draw,” you say? Dan’s method does not require you to be a great artist, but rather a great listener. 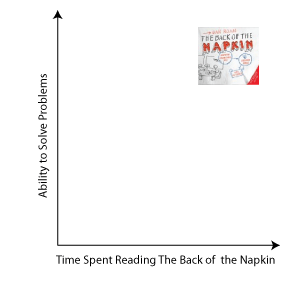 By combining simple pictures with basic questions in an easy to follow process, The Back of the Napkin will immediately improve your ability to solve problems, develop ideas, and gain understanding with others. The book presents a series of basic questions, and then shows simple graphical ideas that depict the answers to them. The questions are nothing new. They are in fact very simple. Who? What? How Much? Where? When? How? and Why? The solutions that these simple sketches uncover are priceless. I encourage you to visit Dan’s web site for some Free Tools he has made available and for more information about the book. I hope you choose to read it and draw on Dan’s wisdom to add to your own.